The dermal papilla (DP), a cluster of specialized fibroblasts, regulate the growth and activity of the various cells in the follicle, thereby, playing a key role in the regulation of hair cycling and growth. Hair follicle regeneration begins when signals from the mesenchyme derived DP cells reach multipotent epidermal stem cells in the bulge region. Large numbers of molecular signals are involved in various phases of the normal hair cycle. The transition of telogen follicles into anagen is associated with activation of Wnt/beta-catenin/Lef1, Sonic Hedgehog (Shh), and STAT3 pathways and down-regulation of bone morphogenetic protein (BMP) signaling. ,, The growth factor BMP-4, also appears to play an important role in suppressing follicular growth and differentiation during telogen. The only Food and Drug Administration (FDA) approved treatment options for male AGA are Finasteride and Minoxidil, which show cosmetically acceptable new hair growth in modest percentage of patients. Even after more than a decade of their FDA approval, they aren't any new FDA approved treatment modalities. Recently, Microneedling induced hair growth in mice has been reported. , This is the first human study of the use of Microneedling for hair re-growth in men with AGA. Men between 20 years and 35 years of age with mild to moderate (III vertex or IV AGA), according to Norwood-Hamilton grading scale were enrolled in the study. Men on Finasteride or other anti-androgenic medications within past 6 months, any known systemic Illness were excluded. A 12-week randomized, comparative, evaluator blinded study was conducted at the Department of Dermatology, Lokmanya Tilak Muncipal Medical College and Hospital, Sion, Mumbai from October 2011 to June 2012. A total of 100 men with AGA were enrolled in study after taking an informed consent. They were randomly allocated into Microneedling (N = 50) and Minoxidil group (N = 50) by using the 'tossing coin' method. All patients' scalp was shaved off before treatment to ensure equal length of hair shaft at baseline. In the Microneedling group, patients received a weekly Microneedling procedure on the scalp with 1 ml of 5% Minoxidil lotion applied twice daily. In Minoxidil group, patient applied only 1 ml of 5% Minoxidil lotion twice daily. The shaven scalp was prepared with betadine and normal saline. A dermaroller of 1.5 mm sized needles was rolled over the affected areas of the scalp in a longitudinal, vertical, and diagonal directions until mild erythema was noted, which was considered as the end point of the procedure. All patients were instructed not to apply Minoxidil on the day of procedure and to resume its application only 24 h after the Microneedling procedure. The 3 primary efficacy parameters assessed were: Change from baseline hair count at 12 weeks, patient assessment of hair growth at 12 weeks, and investigator assessment of hair growth at 12 weeks. The target thinning area of 1 cm diameter, on the vertex was defined by two diagonally placed tattoos to ensure reproducibility. Then, the hair counts were obtained from color Macro-photographs of remnants of the shaven hair in the target area. Macro-photographs were taken at fixed focus, distance, and exposure by use of a specialized adapter attached to the camera [Figure 1]. These images were printed on A4 size Kodak matt-photography paper at baseline and at 12 weeks [Figure 2]. The visible clipped hair was marked with a black dot and these were counted by a blinded evaluator at baseline and at 12 weeks (the target area was once again clipped off at week 12). The resulting hair counts per square centimeter from the fixed area were used to calculate mean change from baseline [Figure 3]. Standardized color global photographs of the affected area were taken with the head in a stereotactic positioning device [Figure 4]. Paired baseline and post-treatment photographs were independently reviewed by a blinded evaluator, with the use of the standardized 7-point rating scale (-3 = greatly decreased, -2 = moderately decreased, -1 = slightly decreased, 0 = no change, +1 = slightly increased, +2 = moderately increased, +3 = greatly increased). 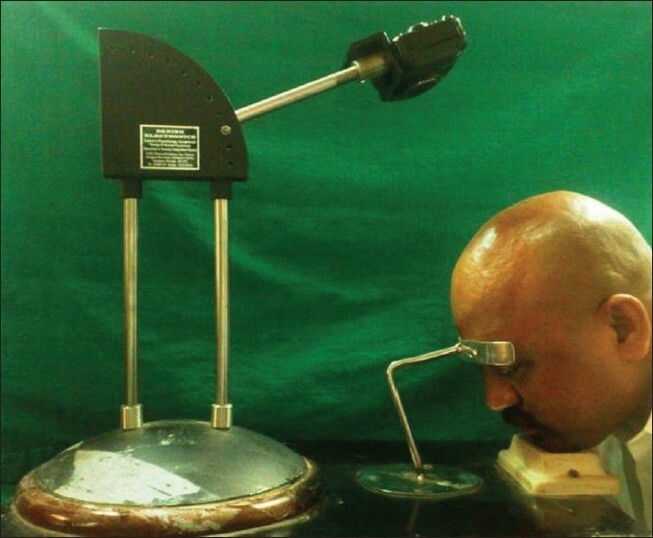 Patients assessed their scalp hair on hair growth assessment scale of 0-4 (0: No improvement; 1: 1-25% improvement; 2: 26-50% improvement; 3: 51-75% improvement; 4: 76-100% improvement). The results were tabulated on SPSS software using paired t-test and its statistical significance was evaluated. 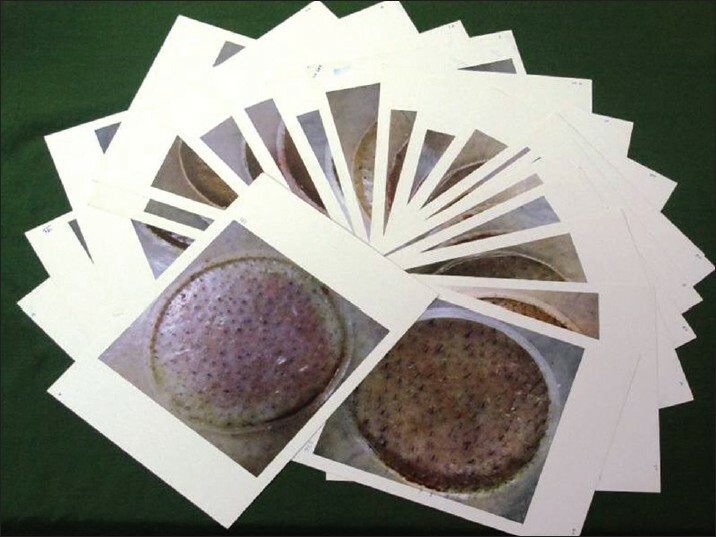 Ninety four of the 100 subjects completed the 12 week study period of which 50 were treated with both Microneedling and 5% Minoxidil lotion (Microneedling group) and 44 were treated with only 5% Minoxidil lotion (Minoxidil group) (6 subjects lost to follow-up and they were not considered for efficacy evaluation). Patients demographic and hair loss features at base line were similar among the both groups. The mean age of the population was 28.6 years. Patients had hair loss for a mean average of 4.5 years (range: 3-10 years). In Microneedling group, 23 had grade III vertex and 27 had grade IV hair loss. Similarly, in the Minoxidil group, 21 had grade III vertex and 23 had grade IV hair loss. 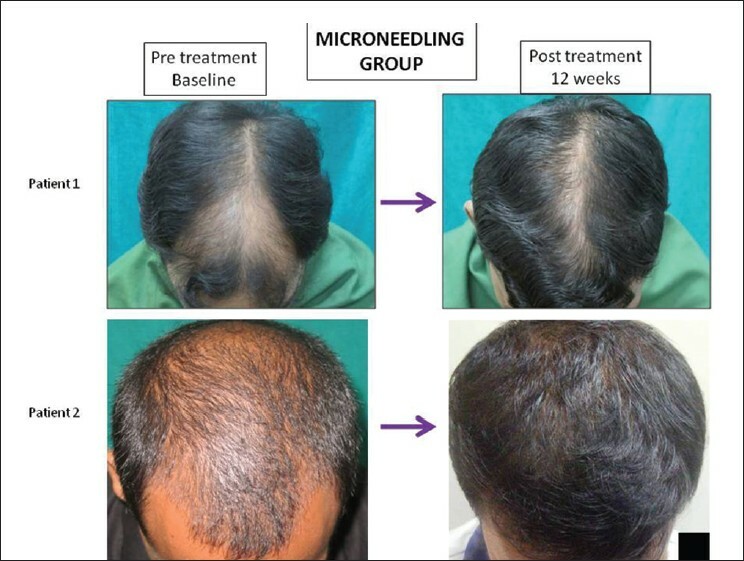 A total of 94 patients, 20 had been treated with Finasteride and Minoxidil in the past for 6 months to 1 year duration and had reported no improvement, of which twelve were randomized to the Microneedling group and eight to the Minoxidil group. Change from baseline hair count at 12 weeks was a primary efficacy variable. There was steady increase in target area hair count over 12 weeks in subjects of Microneedling group. The mean change in hair count at week 12 was significantly greater for the Microneedling group compared to the Minoxidil group (91.4 vs. 22.2 respectively, P = 0.039) [Figure 5] and [Table 1]. Investigator evaluation of hair growth at week 12 was a primary efficacy variable. Forty patients in Microneedling group had +2 to +3 response on 7-point visual analogue scale, while none showed the same response in the Minoxidil group [Table 2], [Figure 6] and [Figure 7]. 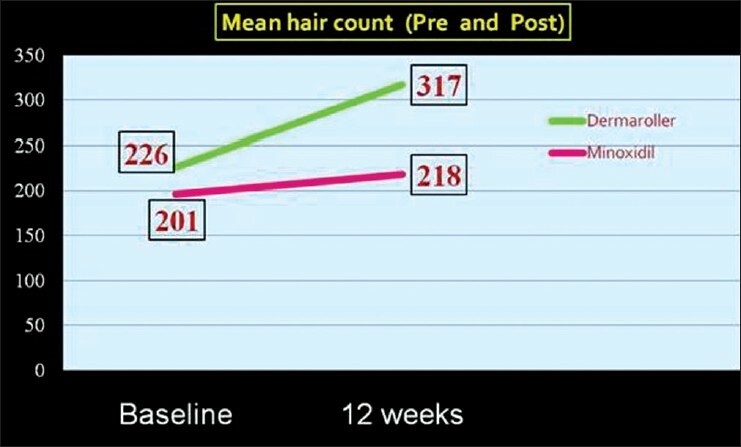 Patient subjective evaluation of hair growth at week 12 was a primary efficacy variable. In the Microneedling group, 41 (82%) patients versus only 2 (4.5%) patients in the Minoxidil group reported more than 50% improvement [Table 3]. There was no significant adverse effect in both Microneedling and Minoxidil group. 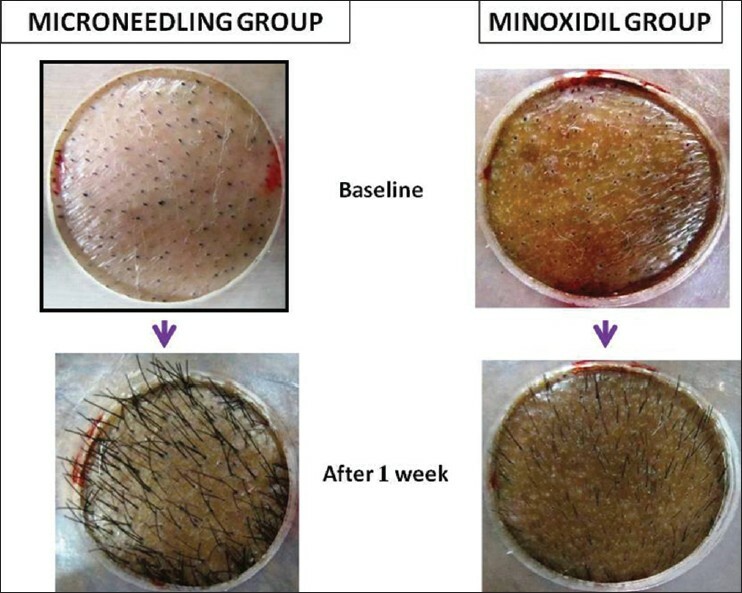 Rapid growth in the existing hair was seen at week 1 in the Microneedling group than Minoxidil group [Figure 8]. Twelve men, unsatisfied with Finasteride and Minoxidil in the past, had +1 and +2 responses (4 and 8 men respectively) in Microneedling group on investigator's evaluation. 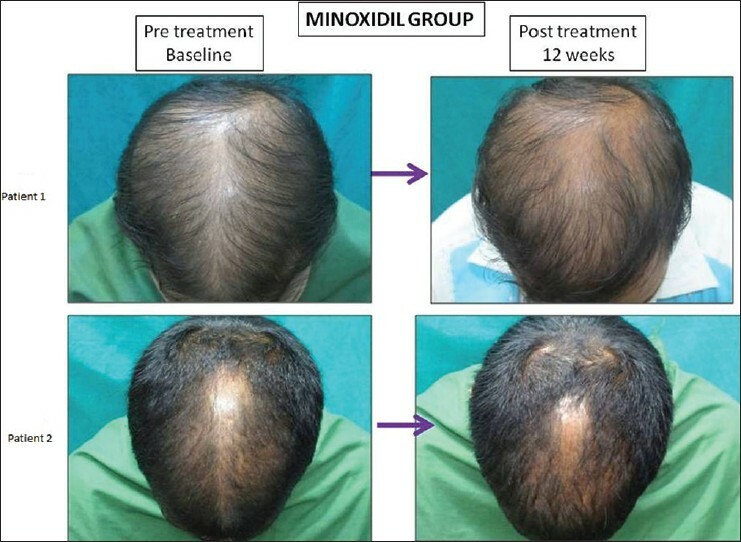 Similar eight unsatisfied men to the previous treatment, showed no change after 12 week study period in the Minoxidil group. Minoxidil and Finasteride are the only FDA approved treatment modalities for AGA. Studies on repeated Microneedling stimulation by Jeong et al. and Kim et al. showed the enhanced expression of hair related genes and stimulation of hair in mice. Kim et al. also noted earlier and faster hair re-growth with more shiny texture of the hair in micro needle treated group than the untreated mice group. 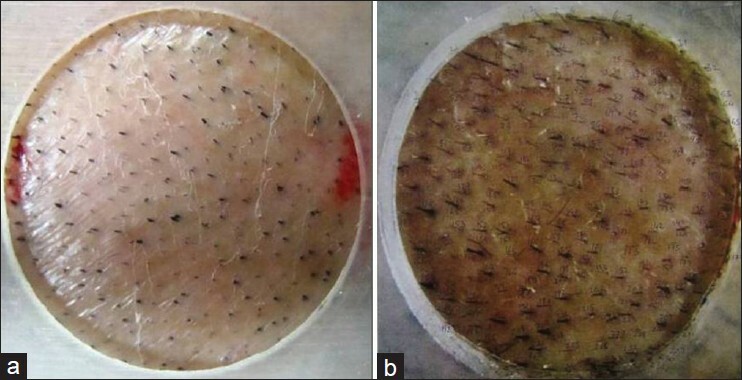 The authors also suggested that micro needle roller could be useful to treat hair loss refractory to Minoxidil therapy. The present 12-week study showed that dermaroller along with Minoxidil treated group was statistically superior to Minoxidil treated group in promoting hair growth in men with AGA for all 3 primary efficacy measures of hair count and patient/investigator assessment of hair growth/scalp coverage. On retrospective questioning of patients after 8 months of completion of the study, at the time of writing the manuscript, all patients in the Microneedling group reported a sustainable response. The results of this study show that Microneedling is a safe and a promising tool in hair stimulation both for male and female AGA and also is useful to treat hair loss refractory to Minoxidil therapy. We opine that Microneedling procedure should be offered to patients with AGA along with the existing therapeutic modalities for faster hair re-growth and better patient compliance. However, issues regarding Microneedling viz; different sizes of needles of the dermaroller, frequency, duration and end point of the procedure are yet to be answered. This is the first study of use of Microneedling in male AGA. 1. Kwack MH, Sung YK, Chung EJ, Im SU, Ahn JS, Kim MK, et al. Dihydrotestosterone-inducible dickkopf 1 from balding dermal papilla cells causes apoptosis in follicular keratinocytes. J Invest Dermatol 2008;128:262-9. 2. Chen D, Jarrell A, Guo C, Lang R, Atit R. Dermal β-catenin activity in response to epidermal Wnt ligands is required for fibroblast proliferation and hair follicle initiation. Development 2012;139:1522-33. 3. Reddy S, Andl T, Bagasra A, Lu MM, Epstein DJ, Morrisey EE, et al. Characterization of Wnt gene expression in developing and postnatal hair follicles and identification of Wnt5a as a target of Sonic hedgehog in hair follicle morphogenesis. Mech Dev 2001;107:69-82. 4. Plikus MV, Mayer JA, de la Cruz D, Baker RE, Maini PK, Maxson R, et al. Cyclic dermal BMP signalling regulates stem cell activation during hair regeneration. Nature 2008;451:340-4. 5. Jeong K, Lee YJ, Kim JE, Park YM, Kim BJ, Kang H. Repeated microneedle stimulation induce the enhanced expression of hair-growth-related genes. Int J Trichology 2012;4:117. 6. Kim BJ, Lim YY, Kim HM, Lee YW, Won CH, Huh CH, et al. Hair follicle regeneration in mice after wounding by microneedle roller. Int J Trichology 2012;4:117. 7. Messenger AG, Rundegren J. Minoxidil: Mechanisms of action on hair growth. Br J Dermatol 2004;150:186-94. 8. Tosti A, Duque-Estrada B. Treatment strategies for alopecia. Expert Opin Pharmacother 2009;10:1017-26. 9. Mella JM, Perret MC, Manzotti M, Catalano HN, Guyatt G. Efficacy and safety of finasteride therapy for androgenetic alopecia: A systematic review. Arch Dermatol 2010;146:1141-50. 10. Schweiger ES, Boychenko O, Bernstein RM. Update on the pathogenesis, genetics and medical treatment of patterned hair loss. J Drugs Dermatol 2010;9:1412-9. 11. Zimber MP, Ziering C, Zeigler F, Hubka M, Mansbridge JN, Baumgartner M, et al. Hair regrowth following a Wnt- and follistatin containing treatment: Safety and efficacy in a first-in-man phase 1 clinical trial. J Drugs Dermatol 2011;10:1308-12. 12. O'Toole1 EA, Mellerio JE. Wound healing. In: Burns TB, Cox N, Griffiths C, editors. Rook's Textbook of Dermatology 8 th . Blackwell Publishing. 2010. p14.1-27. Nirmal, B., Somiah, S., Sacchidanand, S., Biligi, D., Palo, S.